Evergreen Lodge is a luxury cabin located in Granite Ridge with an open floor plan, gourmet kitchen and Wi-Fi. Relax with a game of pool in the game room loft or cook on the propane bbq on the large wood deck. This 4 bedroom, 2.5 bathroom cabin offers plenty of room to wiggle with 1 king, 2 queens, 1 full and 1 futon . Bring your family and friends for a trip on the lake or a day on the slopes. 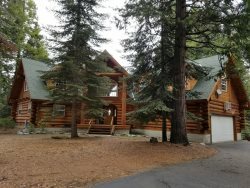 Shaver Lake is about ten minutes away and China Peek Ski Resort is a short thirty minute drive. No Pets. Approx 2,230 sq ft. 2 night minimum required. HOLIDAYS MAY REQUIRE 3-4 NIGHT MIN.